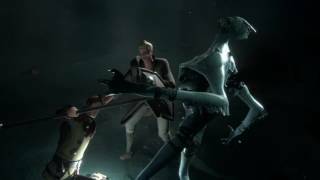 Ashen was one of the newer games to be revealed at the Xbox E3 briefing; it is being developed by Aurora 44, in Wellington, New Zealand. The game is set in a world where there is no sun; instead, light is spat forth from giant eruptions upon high that cover the world in ash. The game is pegged as a combination between Dark Souls and Journey. The former, for its stamina-based combat, which every game developer and their son has seemed to latch onto lately, and the latter for its almost cell-shaded, cartoon-ish art style. At E3 2017, I sat down to watch a short playthrough of some combat and co-op dungeon crawling. Ashen is open world, and we began in a small, forested area about one hour into the game. The team’s native New Zealand inspires the environment which, if you’ve watched Lord of the Rings, is known for spanning vistas, valleys, and orcs. You have solitary streams, around which cliff-side paths can elevate you to different sections of the map, as well as forested patches of land. Its pleasing, simple art-style evokes indie game aesthetics and the almost childlike representation of the characters and enemies you happen across further reinforce this. Dangers lurk in the wild, and you can bash them with your club. We ran into some crab-like foes, as well as vagrants that have taken up residence in the forests. You can dodge, attack, whip out charge attacks and finally loot corpses for items. Combat is not lightning fast, and is more reminiscent of the sometimes-ponderous encounters in the earlier Dark Souls games. Whether it has the punishing nature and lasting challenge of that game series—I couldn’t tell. It seemed perfectly serviceable. You can upgrade your weapons to do more damage and also drink from a stream to buff your stamina. In Ashen, however, you are not alone. NPCs are the main story conduit to learn about your strange, apocalyptic world. You can strive to look like an individual, though. There’s character customization for gender, hairstyles, and weapons. While there is no XP, there is a house/town progression: you can invite players back to your town and they will join your burgeoning colony. When someone joins your settlement, they come with unique skills and crafting abilities to bolster your chances of survival. A large component of the game is its passive multiplayer, which seamlessly lets other players drop in and out of your world. This is especially important because you’ll need otherworldly help to complete dungeons. We were lucky to have someone waiting in the wings who swept in to allow us to enter the dungeon and reveal some of Ashen’s thematic elements. Light and dark. A story as old as time. In the dungeon we ventured into, spiders lurked in narrow corridors, compressing out combat space. As we wandered around the tunnels, the team explained that environmental storytelling is how they want us to learn about the world of Ashen. This comes of the form of skeletons strewn about the cavern, strange markings on the walls—it is up to you to put the pieces of the past together. Secrets are also a big thing, and we wriggled around ledges or broke down walls to find loot or alternative pathways. Having our fill of adventuring, we ventured towards the cave’s boss: the Elder Dark. To defeat this wraith-like enemy, our players had to harness the power of light, via their lanterns, to temporarily weaken the boss and stop it from zipping about. Using a combination of spears and clubs, teamwork prevailed the Elder Dark was no more. Upon the boss’s defeat, the creature dropped a relic of the past, which are tied to the game’s storyline. We took this item to a lady playing a harp, who was perched on the edge of an outcropping of rock, the open mouth of a cavern below. Our player delivered the item to her, conjuring a giant, ethereal woman. And that was that. 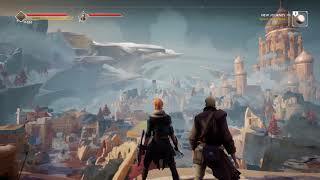 Based on the demo we saw, it feels like Ashen still has a long way to go to establish its gameplay, improve the mechanics and buff the visuals. But without the pressure of an announced release date, it will hopefully get there. The game is planned to release on Xbox One and PC. "A Souls-like that earns its keep"
Ashen (PC) is ranked #928 out of 1435 total reviewed games. It is ranked #71 out of 146 games reviewed in 2018.